Native grasses grow best in zones 5-9. They are tolerant of a wide range of soils but are best suited to moist sandy or clay soil. Plant the seeds 2-3 feet apart. It does best in full sunlight; they will grow in partial shade but the chances of the plants flopping over and losing structure is more likely. Compost and organic matter should be incorporated into the soil. For the first year, the plant should be frequently watered. Once a deep root system has developed and the plant has established itself, the watering can be cut down because native grasses are used to living on rainfall. In March to April, the clumps should be cut down to 3-6 inches, which inhibits the growth of weeds. It must be divided every three years by digging the clump up and dividing it into several clumps (2). Native grasses should be deadheaded regularly to promote the growth of flowers. If the plant grows too tall and starts to sag, then it should be staked. The leaves will yellow if the plant does not get enough nutrients. The plant self-sows (3). Native grasses are beneficial for the environment for several reasons. Switchgrass provides nesting and shelter to rabbits, pheasants and quail. It is also a source of food for pheasants, quail, turkeys, doves and songbirds. The roots can reach up to 10 feet deep and make it a good choice for xeriscaping because it is drought tolerant and does not need to be watered at all after the first year of growth. 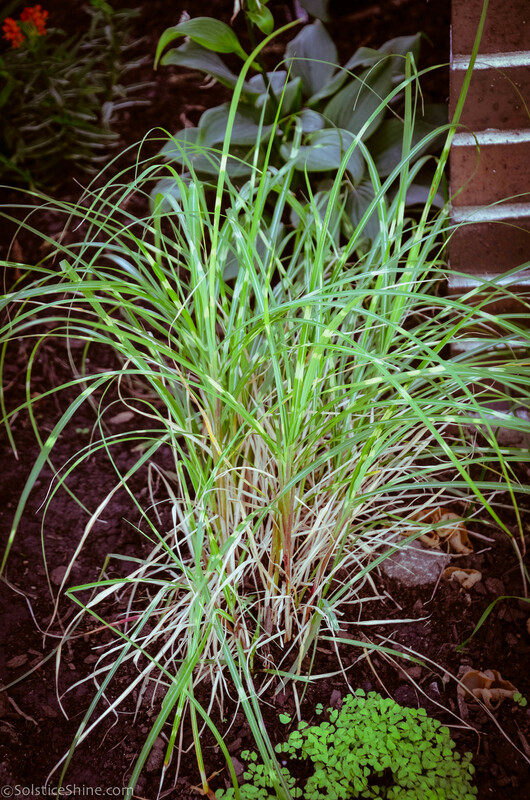 Additionally, native grasses are great options for stormwater management. They stabilize the soil on strip-mine, sand dunes, gullies and other locations. Switchgrass is well-adapted to the North American environment and requires little care or pesticides (1). Native grasses also attract birds to feast on the mature seedheads in fall. Once native grasses establish their root systems in the first season of growing, they do not need any maintenance whatsoever because of their deep strong root system. Lastly, native grasses and plants help an area maintain a healthy ecosystem because they attract a diverse variety of birds, butterflies, and animals, which enhances the biodiversity and sustainability of the ecosystem (4). Native grasses are toxic so they should not be ingested in any form. Native grasses are mainly used for ornamental purposes in gardens, particularly in crafting native prairie gardens. One particular variety of grass was cultivated by the German, Karl Foerster. In the early 1900s, Karl wanted perennial gardens that were sturdy, looked good massed, and he was drawn to plants with elegant but strong flower spikes. Grasses were always a central aspect of his gardens and today, few native gardens are without Calamagrostis x acutiflora 'Karl Foerster' (5).